“I was born on horseback!” Ahmed Mazhar used to say to his friends and the media. When asked to explain this statement, he answered laughingly that his mother loved horse riding and that she felt labour pains whilst she was riding a horse, so she hurried to her house and shortly thereafter gave birth to Ahmed, on 8 October 1917, one hundred years ago. Although this account isn’t supported by logic, it revealed the profundity of Mazhar's relationship to horses. It fits marvellously as a key in understanding the personality of a man who didn’t forsake chivalry in word or deed, in ethics and behaviour as well as in lifestyle. It became an original part of his psyche, to the extent that the word knight and Ahmed Mazhar became inseparable. In the prime of his youth, Egypt was living the political turmoil of the 1940s and the 1950s. Mazhar believed that sacrificing his life was nothing for the sake of a principle or achieving an objective. He faced many moments of danger when a member of the group of General Aziz Al-Misri, one of the symbols of the nationalist struggle in the 1940s. Then he became a member of the Free Officers organisation, which mounted the July 1952 Revolution. It was the knight’s ethics itself that prevented him benefitting from a historical event such as the July Revolution and not even attempting to exploit his friendship with the revolution’s men. If he didn’t have inner constraints, he would have amassed personal gains at a time when the military elite was controlling all the state’s key posts. Even after leaving the armed forces for the sake of art, Mazhar always kept trying to prove that his was not a fleeting success, but he was capable of staying the course. This was confirmed in memorable roles, for the knight proved his impeccable capability to reach the highest pinnacles of appreciation and endearment. The man was the star of Egyptian cinema’s most important three historical films: Saladin (El Naser Salah El Dine), Oh My Islam and Al-Shaimaa. He was also the star of important and remarkable films such as The Curlew Prayer, Djamilah, Cairo 30, Soft Hands, I Won’t Confess, The Last Night, Nadia and The Empire of M.
All the aforementioned films and others prove that his success wasn’t a coincidence and he deservedly attained special stature among Egyptian cinema actors. Ahmed Mazhar graduated from military college in 1936. His colleagues were late presidents Gamal Abdel Nasser and Anwar El-Sadat, as well as Khaled Mohieddin, Abdel-Hakim Amer and other members of the Revolutionary Command Council that ruled Egypt following the July Revolution. Sportive in his youth, Mazhar enjoyed boxing, shooting and equestrianism for which he participated in both the London Olympics (1948) and the Helsinki Olympics (1952), which prevented him from partaking in the events of the 23 July Revolution. As for his work in cinema, it started as a kind of adventure when he played a limited part in the historical film The Advent of Islam (1951) directed by Ibrahim Ezz-Eldine, while he was still an officer in the cavalry. It took six years before Mazhar left the military for the sake of acting. He started with A Romantic Journey directed by Mahmoud Zulfikar, Port Said and My Heart is Restored by Ezzel-Dine Zulfikar (all released in 1957), which were only the beginning of a long road that see him act in over 90 films. 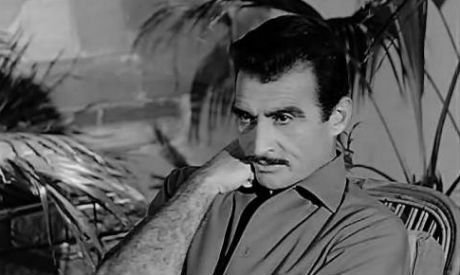 Mazhar emerged in an age where Omar Sharif and Abdel-Halim Hafez were romantic leads while Farid Shawqi, Rushdy Abaza and Ahmed Ramzi were the stars of action films. Mazhar had to search for a distinctive artistic persona. He also entered cinema when he was 40 years old, and this confined him to certain roles. Perhaps this drove him in his early beginnings to choose mature roles, such as in The Road of Hope, directed by Ezzel-Dine Zulfikar, The Blocked Road by Salah Abu-Seif (both released in 1958) and The Curlew Prayer by Henry Barakat in the following year. He began moving between different roles and starring in several Egyptian classics, on the top of which comes Saladin (1963) directed by Youssef Chahine, Oh My Islam (1961) by Andrew Marton, The Black Eyeglasses by Hossam Eddine Mostafa, The Last Night by Kamal Al-Sheikh (both released in 1963), Cairo 30 (1966) by Salah Abu-Seif and Al-Shaimaa (1972) by Hossam Eddine Mostafa. Perhaps Mazhar didn’t show outstanding acting abilities in his early roles, but with the succession of roles and the accumulation of experience, he became capable of holding characters skillfully, even when the differences between these characters were delicate. If played the womaniser many a time, he had a total grasp of the difference between a man who is seeking to entrap his female victims with calculated movements and a low voice — as manifested in The Road of Hope, The Blocked Road and The Curlew Prayer — and the man whose victims come willingly to satisfy his desires, as in Cairo 30 and Sins of Love (1977) directed by Yehia El-Alami. The actor’s professionalism becomes evident when he is capable of projecting emotional differences according to the character he portrays. Thus, the impotent husband’s nervousness in The Virgin Wife (1958) directed by El-Sayed Bedeir was quite different from that of the coarse-natured husband in The Agony of Love (1960) by Salah Abu-Seif and from that of a third husband, moved by doubts concerning his wife’s fidelity, in The Olive Branch (1962) by El-Sayed Bedeir. What if the emotion expressed from a character is neither sinister nor grey, but from an almost spotless character. In Saladin, Mazhar chose a calm voice tone that dominated his portrayal of the great leader throughout the film, even in the hardest and most difficult situations save one scene. It was the famous trial scene in which Ahmed Mazhar’s emotional performance reached a crescendo in his voice, movement and facial expressions, projecting extreme sorrow, charged with bitterness and articulating anger that engulfed this grand personality. Mazhar showed in every character he portrayed an obvious dexterity in comprehending their psychological dimensions and dramatic motivations. Indeed, he earned his place as one of the greats of Egyptian cinema.